This recipe is perfect for summer. Make it for your family, or double the recipe and take it to your next BBQ party. For an added twist, you can cook the potatoes on the BBQ. So delicious. 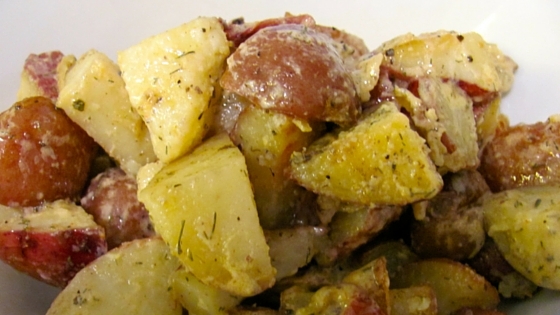 Toss cubed potatoes with 2 tablespoons of olive oil. Evenly spread potatoes out onto a baking sheet, and cook in the oven for approximately 25 minutes. Turn potatoes half way through cooking time. Remove from oven and set aside to cool. You want the potatoes to be a golden brown. While potatoes cool, make the dressing. Whisk together all dressing ingredients in a bowl or salad dressing jar. Toss potatoes with dressing and serve.